Printed on environmentally tolerant 15 pt. calendar vinyl with a 3/8" brass eyelet. All tags meet OSHA 29CFR1910.145 specifications for accident prevention tags. An innovative new way to communicate valuable safety messages. Choose from over 24 full-color pre-printed messages. Your personalized company message is printed on the back. Free imprinting in black ink on back of cards with orders of 200 or more. 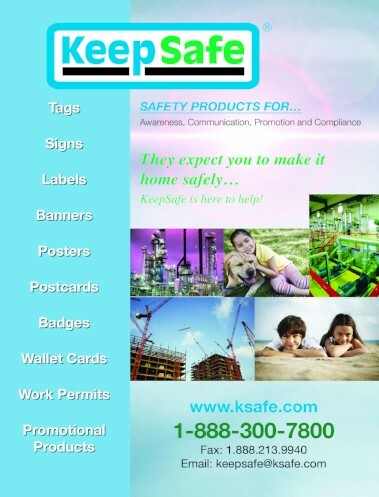 Welcome to KeepSafe, not just another safety company! Best known for the quality safety tags and labels we produce and supply to business and industry, KeepSafe is now setting its sites on meeting the challenges of a new millennium. In response to these challenges, KeepSafe has broken fresh ground by developing a variety of new and innovative safety products to help companies launch their health and safety programs into the 21st Century. Safety tags for equipment, inspection, scaffolds and more. Buy safety tags in a variety of formats and materials from our huge selection. As you can see we have completely changed our website to help better serve you, this also means we are under progress on getting up to date. If you do not see something or have a question about pricing, do not hesitate to call or send us an email. Thank you for your time and patience, have a great day! KeepSafe takes pride in our products and wants to completely satisfy your every need. That's why we would love for you to give us a call or send us an email if you have any questions! Check out our 2018 catalog if you did not find what you were looking for!